Rebel Sport, Australia’s leading sports store is the authority on all things sport. Offering a wide range of quality branded clothing, footwear and sporting equipment at competitive prices, you’ll be spoilt for choice. 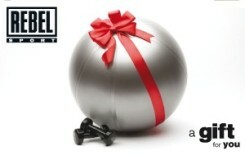 Use your gift card at over 90 stores nationally and online at rebelsport.com.